2005 - 2013 Lecturer, Department of Industrial Engineering and Management, Ben-Gurion University of the Negev. 2013 - 2015 Senior Lecturer, Department of Industrial Engineering and Management, Ben-Gurion University of the Negev. 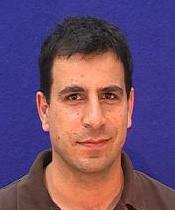 2013 Instructor, Unit of Energy Engineering, Ben-Gurion University of the Negev. 2015 Instructor, Department of Operations Management, Sapir Academic Coledge. I. David and O. Levi, 2001, “Asset selling problems with holding costs,” The International Journal of Production Economics Vol. 71, pp. 317-21. I. David and O. Levi, 2003, “A new algorithm for the multi-item exponentially-discounted optimal selection problem, ”The European Journal of Operational Research. Vol. 153(3), pp. 782-89. J. Miao , F. Forester and O. Levi , 2005, Equally-sloped tomography with oversampling reconstruction,” Physical Reviews, B72, 052103, 2005. J.L. Stark , V.J. Martinez , D.L. Donoho , O. Levi C , P. Querre, and E. Saar C , 2005, “Analysis of the spatial distribution of galaxies by multi-scale methods,” The EURASIP Journal on Advances Signal Processing, Vol. 15, pp. 2455-2469. O. Safren , V. Alchanatis , V. Ostrovsky and O. Levi C , 2007, “Detection of green apples in hyperspectral images of apple-tree foliage using machine vision,” Transactions of the American society for Agricultural and biological Engineers Vol. 50(6), pp. 2303-13. H. Golan , O. Israel , A. Frenkel , Y. ParmetC, A. FeintuchC, J.A. KennedyC, O. LeviC and Y. GidronC, 2009, “Brain map ng of patients with lung cancer and controls: Inquiry into tumor-to-brain communication,” Journal of Nuclear Medicine, 50(7), 1072-75, 2009. (3 citations by ISI; IF 5.77; 6/119; Q1). E. Castro , B. EfrosS and O. Levi C , 2010, “Networks of polynomial eces with applications to the analysis of point clouds and images,” Journal of Approximation Theory, Vol. 162(1) pp. 94-130. O. Levi , S. Cohen , Z. MhabariS, 2011, “Effective Hyper-spectral image segmentation using multi-scale geometric analysis,” The International Journal of Computer Information Systems and Industrial Management applications (IJCISIM), Volume 3, pp. 836-845. S. Evladov , O. Levi , A. Stern , 2012, "Progressive Compressive Imaging from Radon projections," Optics Express, Vol. 20, Issue 4, pp. 4260-4271. Y. Kashter , O. Levi , A. Stern , 2012, “Optical compressive change and motion detection,” Applied Optics, Vol 51, Issue 13, (11 citations by ISI; IF 1.41; 12/71; Q1). S. CohenS, C. Yafit , V. Alchanati , O. Levi , 2013, “Combining spatial and hyperspectral information for delineation of homogenous management zones,” special issue on Sensing technologies for Sustainable Agriculture, Biosystems Engineering, Vol 114, Issue 4, 435-443. P. Berman , O. Levi , Y. Parmet , M. Saunders , Z. Weisman , 2013 “Laplace Inversion of Low-Resolution NMR Relaxometry Data Using Sparse Representation Methods,”, Concepts in Magnetic Resonance, Part A, 42(3), 72-88. P. Berman , A. Leshem, O. Etziony, O. Levi, Y. Parmet, M. Saunders , Z. Weisman , , 2013 “Novel 1H Low Resolution (LR)-NMR Applications for the Field of Biodiesel”, Biotechnology of Bio-Fuels, 2013, 6:55. S. Tejman-Yarden, O. Levi, A. Beizerov, Y. Parmet, T. Nguyen, M. Saunders, Z. Rudich, J. Perry, D. Baker, T. Moeller-Bertram, “Heart rate analysis by sparse representation for acute pain detection” Accepted to Biomedical Signal Processing and Control, 2015. D. Donoho and O. Levi , 2003, “Fast X-Ray and Beamlet Transforms for three-dimensional data,” Modern Signal Processing, MSRI publications pp. 79-116. D. Donoho, M. Duncan, X. Hou and O. Levi, About Wavelab, technical report of the department of Statistics at Stanford University 1999. S. Choi, D. Donoho, A. Flesia, X. Hou, O. Levi and D. Shi, About BeamLab - a Toolbox for New Multiscale Methodologies, technical report of the department of Statistics at Stanford University 2002. D. L. Donoho , O. Levi , J.-L. Starck and V.J. MartinezC, 2002, “Multiscale Geometric Analysis for 3-D Catalogues,” S E, Astronomical Data Analysis II (Proceedings Volume), pp.101-11. V. Alchanatis , O Safren , O Levi , V OstrovskyC, JV StaffordC, 2007, “Apple yield map ng using hyperspectral machine vision”, Precision agriculture 07, the 6th European Conference on Precision Agriculture, Skiathos, Greece June 2007, pp. 143-150. A. Stern and O. Levi , 2010, "Optically Compressed Sensing by undersampling the polar Fourier plane", J. Phys. : Conf. Ser. 206 (1) 012019. Proceedings of IADIS International Conference Information Systems, pp. 396-400. Y. Cohen , V., Alchanati , R. Rud C, C., RozenC, O., LeviC, S., Cohen , Z., Mhabari , 2011, Hyper-spectral and thermal images for evaluating nitrogen and water status in potato fields, proceeding of the 8th European Conference on Precision Agriculture (ECPA) March 2011. P. Kurtser , O. LeviC, V. Gontar , 2012, Detection and Classification of ECG Chaotic Components Using ANN Trained by Specially Simulated Data, International Conference on Engineering Applications of Neural Network. A. Stern , Y. Kashter , and O. Levi , 2013, "Compressive moving objects localization techniques based on optical Radon projections ", to be presented at Compressive Sensing II, part of S E-Defense Security and Sensing.